I’m helping to bring science to GeekGirlCon! Well, I am if I can afford it, and that’s where you can help. The indomitable Dr. Rubidium has assembled the Avengers a crack team of science communicators and educators to run a Do-It-Yourself Science Zone at GeekGirlCon, a conference celebrating women and girls in geek culture. The team includes the likes of DN Lee, SciCurious, Nicole “the Noisy Astronomer” Guliucci, and me. We’ll have chemistry experiments, digging up “fossils”, making impact craters, and other fun science-y activities. However, being freelancers and other impecunious sorts, we need your assistance. Any money you donate will help us get to Seattle, buy supplies, and not be reduced to begging for ramen on street corners. In addition, we’ll reward you with many acts of whimsy, from forcing Dr. Rubidium to listen to Nickelback to performing an original song to acting out bad movies with sock puppets. 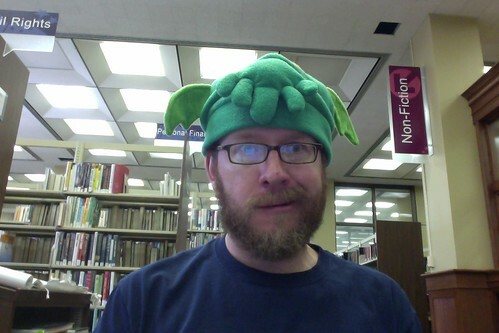 I’ve already appeared in public wearing my Cthulhu hat; the more money you donate, the more often I have to wear it. Please donate, and help us bring science to GeekGirlCon! Cthulhu visits the Richmond Public Library.